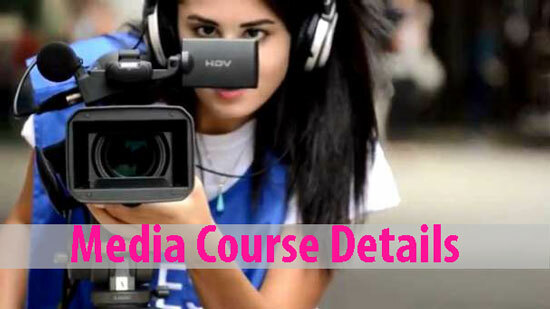 This is the article named Media Courses Details which provides the complete Information about the Course such as Requirements, Duration, Syllabus, Courses Types, Best Institutes, Career Prospectus, Jobs, Salary, etc. Read the complete article to get all the details. Media can be defined as the means of Communication. It is used to deliver and store Information or data. It is involved with fields like the press, advertising, photography, cinema, broadcasting that is both radio and television and publishing. There are many Types of Media Courses. With these courses one can establish a Career in Media. This article is to provide the Complete Course Details. Go through it. There are various types of courses such as Diploma Courses, Bachelors Courses, and Certifications etc. The Duration of this Course is 3 years. This comes under Graduate level and the Eligibility is 10+2. The career after the Courses offers many Jobs with high Salary. One can work for Film Institutes, Start a Production, work as Journalism or work our print or digital media etc. Stay connected with us for more and more updates.